So, I’ve been reading this recently, a book which I thought I should read, seeing as how grappling with cynicism seems to be a hobby of mine. It’s a book that also brings a little light to dawn on explaining the title of this blog. I’m a cynical idealist, I think most cynics are. We wouldn’t be so cynical if we didn’t have ideals. The flip side of cynicism is, in part, rampant idealism, which gets crushed. If we weren’t idealists, why would we swing so widely into cynicism? Anyway. Here’s a good quote which sums it all up better than I could. The Bible gives us the full picture, in our complete complexity of character and understanding. Within that picture there is room to be suspicious, but there is also definite reason for hope. We live with the tension of these two things. 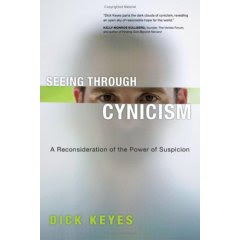 We need to beware that our cynicism doesn’t constantly see through things until there is nothing to see anymore, and we need to beware the naivety of idealism with no suspicion to keep us alert. The Bible allows for the reality of our lives as complex humans in the hands of a Maker God. True wisdom, which the cynic and the idealist should seek, comes from Fearing God. The Fear of the Lord seems to be about living with God as God. With the Maker of the world as the best one to tell us how to live in this world He made. It seems a little simple, which is probably why we struggle with it. We want to be God, we want to live how We want to live. God comes along and tells us that true wisdom comes from Fearing Him, from relationship with Him, from living in His ways, Honouring Him, living in thanksgiving because He is God and we are not. God made the world and knows how it works, it therefore makes sense to live in it as designed. What is a little more complicated is actually living that out. Walking in Fear of the Lord each day, living out the reality of the unseen, trusting in Him and guarding our hearts from the tugs and pulls of the other ways that seemingly offer wisdom at a fraction of the cost. One final thought from the talks was the uselessness of self help books. They contain a wide variety of bonkers ideas but also they contain elements of truth, God’s wisdom is out there in His world. Self help books say stuff that works, that makes some sense of this world, that’s why they are so popular (that and our general tendency to self obsession).